Do you agree or disagree with the following statement? A person should never make an important decision alone. 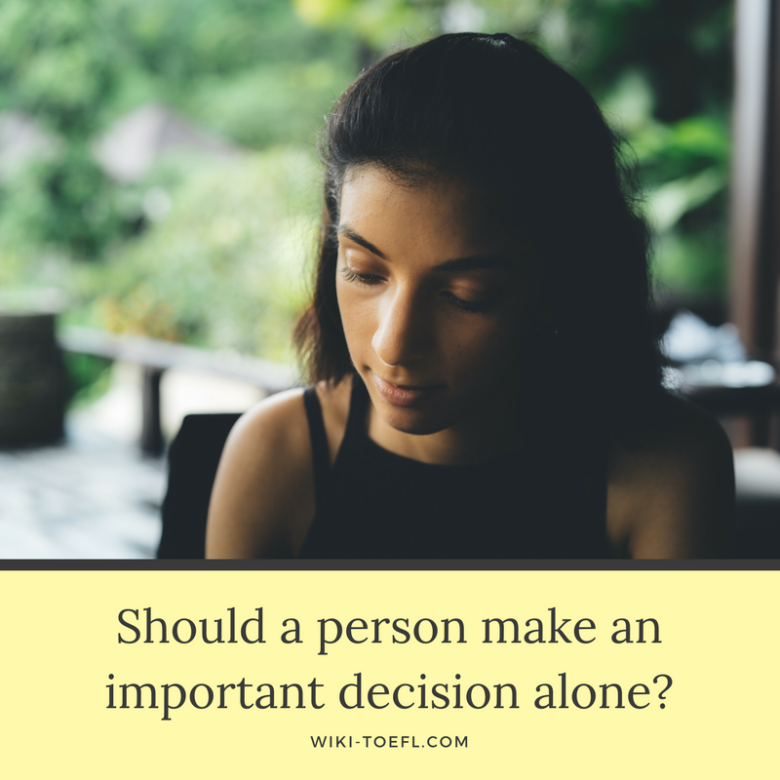 A person should never make an important decision alone. Important decisions should be well thought out. People who know you well, know what is best for you. People close to you can give you good advice, give you a different perspective, or share their own experience. When I had difficulty deciding which classes to take in college, I talked to my teachers and advisors. They had the knowledge and expertise to help me determine which classes were the best ones to take for my future career. Without their advice, I might have chosen unsuitable courses. In college, I had convinced myself that I was not good enough to act in the school play. Therefore, I decide not to audition even though drama bad always been my passion. The day of the auditions, a friend of mine asked me why I wasn’t auditioning. When I told her I didn’t feel I was good enough, she was shocked. She was able to provide me with another perspective on myself and my talents. I rethought my decision and tried out… and got a lead in the play. Last year when I was trying to decide whether or not I should study overseas, I talked to my friend. This was the best thing I could have done. This was a big decision for me because I had never been overseas on my own and I wasn’t sure I could do it. She had studied overseas the previous year. She told me about the challenges and opportunities I might encounter and helped me make the right decision. I went and it was amazing!